VIA's Turbos were increasingly unreliable towards the end of their career, bepatched with yellow duct tape. From 1979 to 1981, VIA replaced the Turbos with conventional consists, both morning and evening runs. These "Turbo replacements" were notable because they were the only VIA trains operating on the Kingston Sub with one unit, usually a FP9A, but sometimes FPA4. Also of note were the consists' length - as few as four cars, as many as seven. Each comprised a Club car, a Cafe-Bar-Lounge, and two to five coaches. Often, the coaches were 5200's or 5300's! 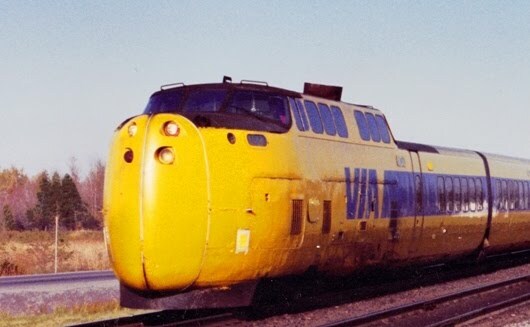 In 1979, as CN passenger equipment was receiving the VIA scheme, these trains were often a mix of CN and VIA paint. I've come across a plethora of interesting consists in preparing this book. VIAphiles will find them of great interest. Highball!